Symphony Gears Musical Toy is rated 4.8 out of 5 by 15. 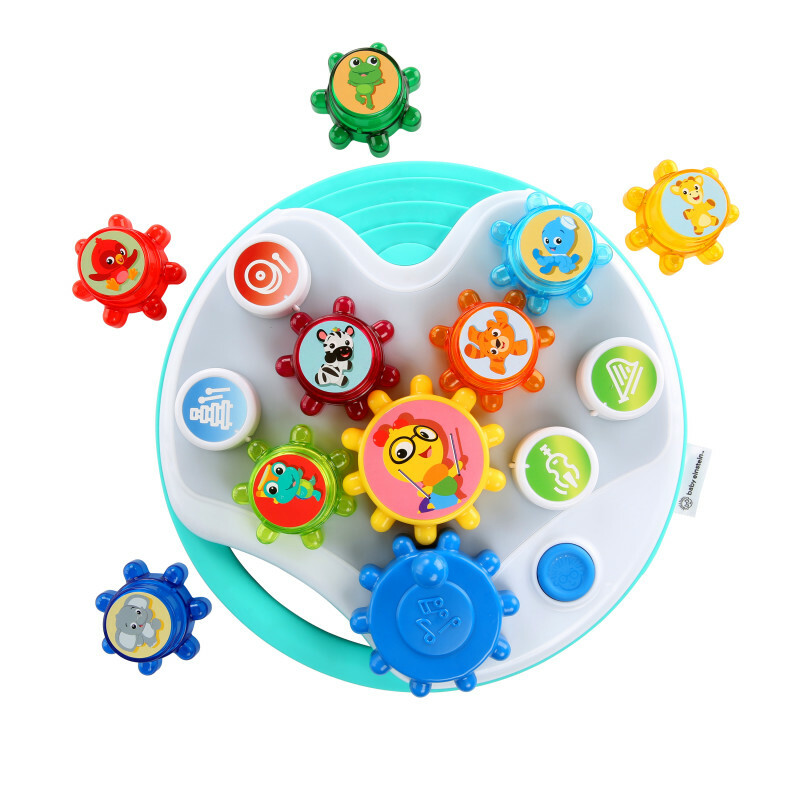 Baby Einstein has set the stage for your baby’s first masterpiece with Symphony Gears. By blending music and early engineering, this discovery toy keeps your little maestro busy as she switches the gears around for surprising results. Watch her explore new melodies as she uses cheerful Baby Einstein characters to stack up different instruments. Every choice she makes causes a new reaction, like engaging sounds and fun colorful lights that flash and move to the rhythm of the beat. With the crank of the big gear or the push of the blue Einstein button, she’ll create a performance like no one’s ever seen or heard before. You can adjust the volume to either high or low settings, or turn it off completely when not in use. You and your baby will enjoy a better musical experience from the higher end quality speaker. Designed to grow with baby, the music will go on for years. Dimension (in) 2.5" x 11.5" x 11.5"
Rated 5 out of 5 by Jaid231 from LOVE My daughter and I both love this toy! It's really different and cool. It keeps her entertained and she loves the colors. I love the baby Einstein toys but this one exceeded my expectations. My daughter loves this toys a lot. Rated 5 out of 5 by momandteacher from One of our favorite toys! After 3 kids, we have been through a lot of toys. This is one of our favorite toys we have ever used with our kids. All of my kids (ages: 6 years, 4 years, and 6 months) can sit together and manipulate the different gears to make sounds and music. This was a big hit with everyone! Rated 4 out of 5 by BL820 from Creative product! Creative product. Will be great for augmenting gross motor (and improving fine motor) control. Interchangeable knobs and engaging sounds allow for longer use. Rated 5 out of 5 by TonyaR from Very colorful and entertaining It is very colorful and bright. My grand daughter liked turning the knobs and listening to the music. Took a few times of playing with it to figure out how to make it "play different sounds and music". I really like the rubber bottom on the toy and it has a volume control/off switch on side too which is really nice. Rated 5 out of 5 by Steponme from Fun and creative toy This is such a cute toy! It can be used in countless ways and keeps baby entertained for a long time. It plays many tunes, lights up, is interactive and teaches them how to add or subtract from an orchestra. There’s also individual instruments that can be heard just by placing a gear on a peg. Travels well with a handle or stays put on a table top thanks to no slip grips on the underside. Also has 2 options for volume which is crucial for a parents sanity. Really cute toy for the musically inclined baby or classic music enthusiast parent. Rated 5 out of 5 by Steponme from Fun and creative toy This is such a cute toy! It can be used in countless ways and keeps baby entertained for a long time. It plays many tunes, lights up, is interactive and teaches them how to add or subtract from an orchestra. There's also individual instruments that can be heard just by placing a gear on a peg. Travels well with a handle or stays put on a table top thanks to no slip grips on the underside. Also has 2 options for volume which is crucial for a parents sanity. Really cute toy for the musically inclined baby or classic music enthusiast parent.